Calling all sporting fans! 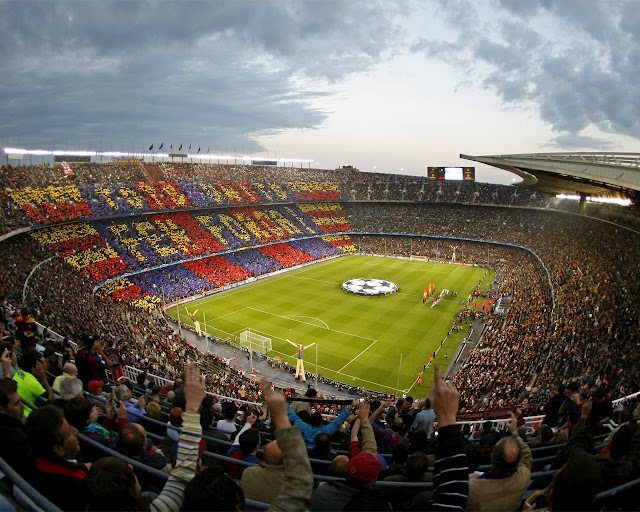 Do not miss this fantastic opportunity to retrace the footsteps of legendary players from past and present on this self-guided tour through Barcelona FC’s Camp Nou football stadium. Your ticket also includes skip the line entry to the Barcelona football museum, where you can enjoy a panoramic view of the stadium and discover the history of this legendary football team. Take this once in a lifetime opportunity to walk in the footsteps of famous players such as Kubala, Cruyff, Maradona, Guardiola and Ronaldinho. Your tour of Camp Nou starts with a visit to the team changing room and a walk through the famous tunnel onto the pitch. Walk on the grass, sit on the team bench and enjoy a panoramic view of the stadium. You will also visit the Chapel, TV Room, Press Room, Fundacio Zone and the Presidential Box.Your tour also includes a skip the line visit to Barcelona FC Football Museum. Start the tour with a panoramic view of the stadium from the grandstand, then take a look back over the long history of the club. Admire the trophies, photographs, sports equipment and team kits from over the years as you wander though this impressive museum. There is also an audio-visual display available. If you’re crazy about football then few things will beat having Nou Camp tickets and seeing one of the world’s greatest football teams in action – imagine the feeling of being there watching Barça’s stars in action, the excited voices of the crowd around you and the exhilaration of seeing your first goal at Barcelona’s famous stadium.